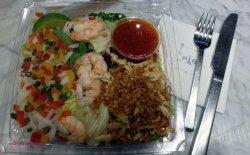 Oriental Salad ($8.50) wasn't bad at all. The salad sauce had this strong sesame taste to it & gets a little jelat at the end, worth a try though! Cafe Latte ($6) cuz old person needs something hot in the morning lol. I am clueless when it comes to tasting coffee, tastes alright? Like any other Cafe Latte. Strawberry Shortcake ($7.50) because I avoided crepe cakes. It wasn't that bad, wasn't bad at all. Just like any other classic strawberry shortcakes that you find in bakeries. But then again, I could have gotten 2 of these from Four Leaves with the same amount hmmm. 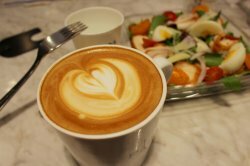 Okay, I had a good meal cuz my salad and latte were both quite good. 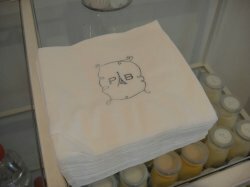 Luckily I didn't order from the brunch menu else I'm not sure if I would even visit PB again lol. Not to mention, service wasn't up to standard. From waiter who threw straws on our table while serving us, to them not cleaning the table (hence no space for dessert). 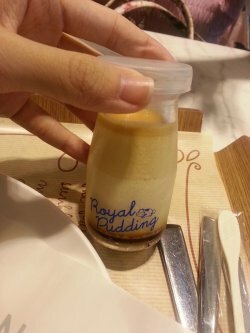 Had always wanted to try their royal pudding but due to its high price, I stopped myself but this time i bought it together with some breads and pastry. All of it taste superb. Garlic bread is my favorite i can finish the whole loaf alone,once you start eating it,you will never stop. 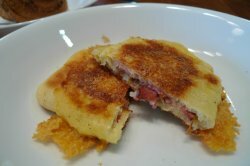 I put it in the oven again when I'm eating it, it became very crispy ,the taste of garlic is just right, a bit of saltiness in the bread makes it addictive. 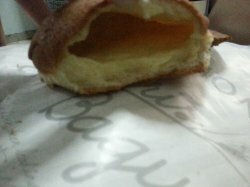 Flying UFO ($2.60) has soft and mildly sweet crust and the custard in it is also alright. 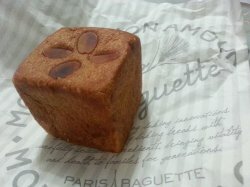 Almond cube ($2.80) is very soft, the almond butter in it is not very heavy,quite an enjoyable pastry too. 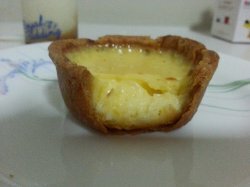 Egg tart has got very crispy crust and I love it, the filling is abit sweet for me buy acceptable overall. 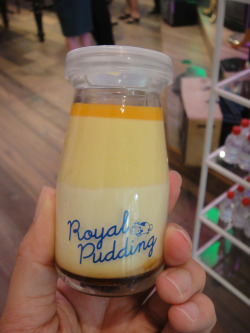 Royal pudding ($4)has 3 layers,milk,pudding and caramel syrup. 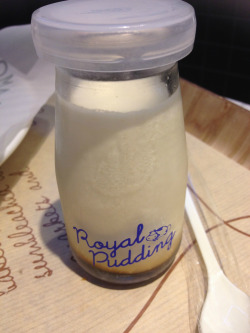 I like the milky taste in it but the caramel syrup underneath makes the whole pudding quite sweet, may be worth a try. 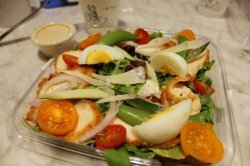 Paris Baguette Café has been pretty much the talk of the uptown, I first knew about its existence past few months. It caught many people’s attention, kiosk looked brightly cool. 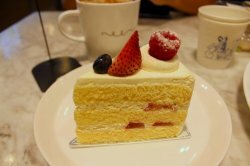 It was actually the Korean top bakery, famous of its freshly pastries and desserts. Highly recommended for the salty snack, it would be rather worth with chubby little shrimp laid on top of the bread bowl holding soup. Presentation was tempting, definitely a scrumptious art. 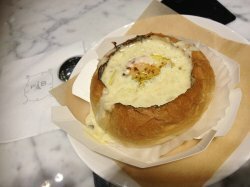 Earnestly to take the spoonful creamy cheesy broth, bread outlay was chewy in texture. The price was $6.00, worth to buy as I cannot explain how hard to resist it. Basically it was few flavours available, I picked the orangey Mango at $4.50. 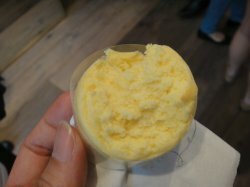 Top layer was sourly filled up by mango jelly, then extremely sweet softness and lastly mild milky pudding. The most bottom part tasted a little bitter, might be coffee liquor I guessed. The blend of glass bottle was a unique mixture, like firework in my mouth enjoyably. This was how I ended my Valentine day, sweetly contented. 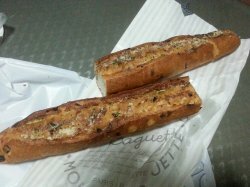 We went to Paris Baguette to buy some bread for breakfast. Judging from the name 'Paris Baguette', I thought that the company originated from France. 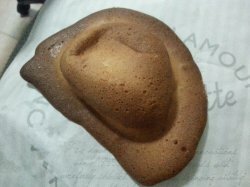 Apparently, it is a Korea based company, which their bakers were trained in French bread making techniques. Shaped like a fattened version of croissant, the sweet cinnamon bun was dusted all over with cinnamon sugar. 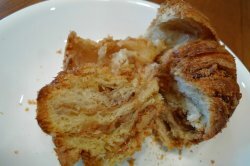 Beneath the crispy crust was layers of fluffy bread with walnuts and cinnamon powder stuffed in between. With the shape of the bread so big and round, you really need to open your mouth wide to get a bite of it. This, on the contrary, is a flattened version of bread. It is called pressed flat bread. Do you notice the cheese 'wings' on the side? Those were really crispy! Wrapped up inside the flattened bread was bacon. 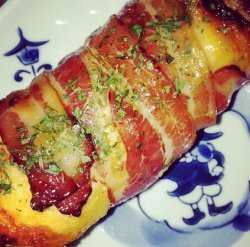 Bacon and cheese, my favorite combination ever! Seafood chowder $6. The prawn was fresh and the texture of the chowder was smooth and creamy, best to be shared as it might be too overwhelming for a person. The bread turned a little soggy after a while but it was understandable. Sweet bacon roll $3.60 - this roll was really sweet and the bacon did not taste salty nor fatty at all! Earl Grey cake $6.50 - the earl grey flavour was quite subtle but the cake was light at the spongey area. Queue was super long even though it was off peak hours. 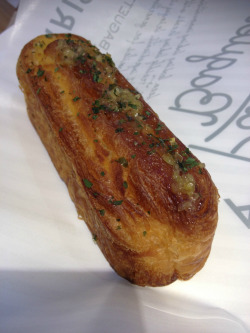 I was so excited when i saw an item called "Sweet Bacon Roll" at Paris Baguette. So excited that i had my sister help me buy it when she passed by the outlet although she wasn't dining there or anything. But i was doomed to disappointment by my own expectations. The Sweet Bacon Roll lived up to its name, because it is indeed very sweet. In my head, bacon is supposed to be salty so there was this conflict going on as i was eating it. Even then i find the bacon a little raw, probably cause its soft. For the price, its not a worthy treat. How can anyone not like Paris Baguette? 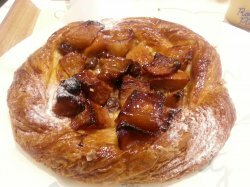 It was one of the best ever pastry i had ever eaten. I was having my tai tai life with another of my girl friend and here is my order: Apple pastry and caramel pudding. I spend $8 in total which i think is reasonable, imagine you went to those 5 stars hotel, you will definitely pay more than that. The caramel pudding was sweet and if you are not a caramel lover (like my friend) you will find it bitter instead. 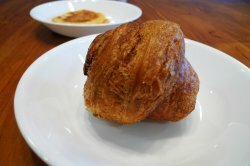 The pastry was crispy and the texture was much more like crackers. i am also very amazed that how the apple able to sustain it juiciness even after baked?! 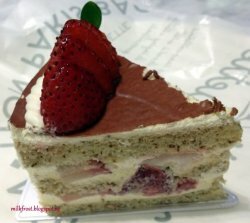 It's tea time at Paris Baguette again! This time my friend and I didn't ordered any bread/cakes as we were kind of full from our lunch. But there's always something to try at this cafe so we decided to go for some lovely beverages! 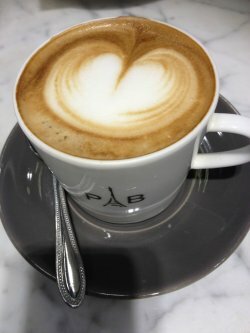 I've gotten their Espresso, it was supposed to come in heart-shaped coffee art so I was kind of disappointed. 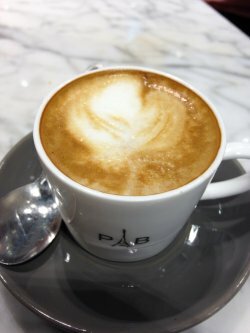 The coffee was very strong in flavour but remained light to drink with at the same time. Did a really good job perking me up with the strong caffeine. 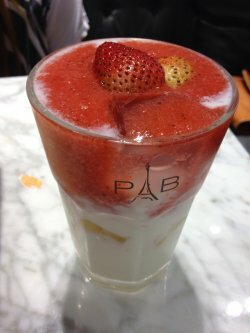 My friend ordered their Strawberry Latte because the name itself was very attractive. However, the generously filled cup was so sour to the extent we didn't believe that any latte was supposed to taste like this. But this explains a lot about the natural ingredients, we didn't blame them because the strawberries they used happened to be really sour as well! 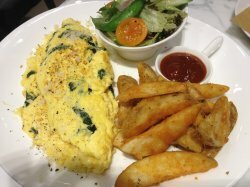 Overall, despite some disappointments, I would still return back to try out other items on their menu! Hopefully they can expand their outlet or something because enjoying tea can be a guilty event when we see other customers finding seats. 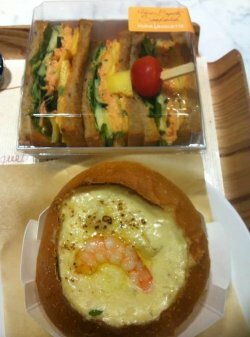 Although Paris Baguette is always crowded and adopts the self-service concept, I always find myself returning for their food! 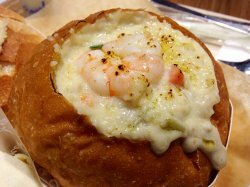 I would always get myself the Seafood Chowder ($6) which is creamy and full of flavour topped with a fresh shrimp. The portion is just right so you would not get too full and would have space for other items. 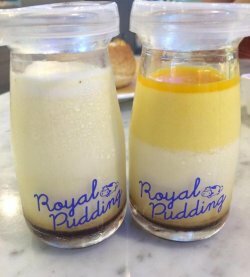 The Original Royal Pudding ($4) is a must have everytime I visit! There's other flavours like strawberry and mango and I would also occasionally get them as solo take-away items if the place is too crowded. If you've never tried this, you're missing out a lot in life. I've also tried the Camembert Cheesecake ($6), which is a blend of cream cheese and other ingredients that gave it a distinctive taste. Worth the try but you may get tired of the taste after awhile if you don't share it with someone else. 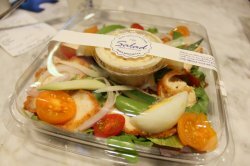 Overall, this place is great, love the food and overall experience, totally a loyal customer. But the place would definitely be better if they have a larger space and more outlets in the future! 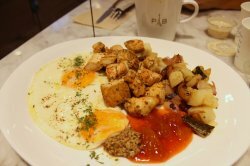 All the while, I have always wanted to try out this cafe at Wisma Atria which should be not bad, judging upon the crowd and its wide variety of the appealing food on display. Thus, I was quite happy to see that there is a new outlet here in the West. 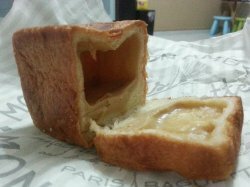 But hmm the pastry was a bit too cold and hard, would have been better if I have requested it to be heated up. 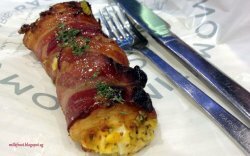 I would recommend the bacon roll ($3.50) though, a good combination to have egg mayo wrapped by bacon. And the chicken wrap ($7.90) is good too but might not appeal to those who cannot take spicy food. It was not too spicy anyway. 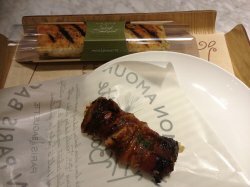 The skin of the wrap was not thick with generous fillings of veggie and chicken. 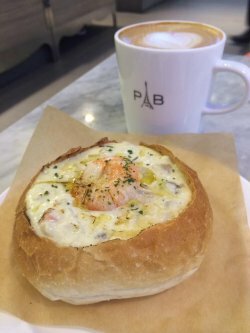 This is my 2nd time dining in Paris Baguette since my last time was to try their puddings and cakes but due their wide variety of breads, cakes, salads, puddings, drinks etc decided to try other items.The food in this store are economic and cosy and nice environment to dine in. We ordered a clam clowder and chicken sandwich. The clam clowder is creamy and nice in flavour and the chicken sandwich with lettuce was crispy and tender. 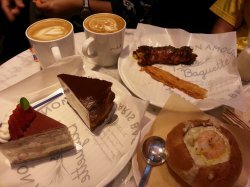 This is my 2nd time dining in Paris Baguette since my last time was to try their puddings and cakes but due their wide variety of breads, cakes, salads, puddings, drinks etc decided to try other items. The food in this store are economic and cosy and nice environment to dine in. We ordered a clam clowder and chicken sandwich. The clam clowder is creamy and nice in flavour and the chicken sandwich with lettuce was crispy and tender. 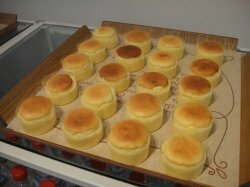 At first look, this Cheese Souffle Cake looked like a Japanese cheese cake. However, when you give a bite, you will notice it does not feel like a cake. 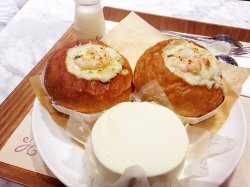 The texture feels like a soft egg pudding with strong cheese flavour.The Cheese Souffle Cake will melt in your warm mouth without needing to bite, just sip like a milk shake. So yummy.If not for the higher prices, one can easily eat 10 of these as a snack. 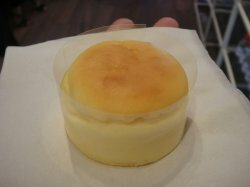 At first look, this Cheese Souffle Cake looked like a Japanese cheese cake. However, when you give a bite, you will notice it does not feel like a cake. 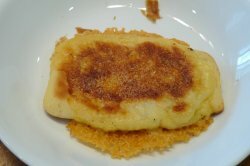 The texture feels like a soft egg pudding with strong cheese flavour. The Cheese Souffle Cake will melt in your warm mouth without needing to bite, just sip like a milk shake. So yummy. If not for the higher prices, one can easily eat 10 of these as a snack. 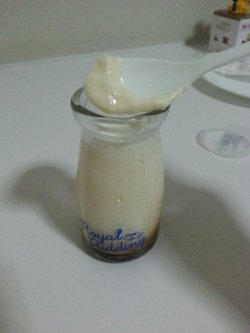 Normally we all know that Milk Pudding was orginated from Hokkaido. 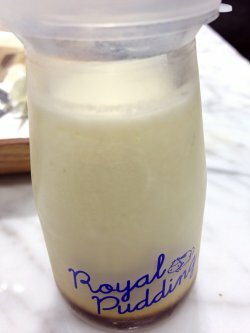 But this Korean Bakery and Cafe also sell this milk pudding, so I decided to give a try. I bought Mango flavour and orginal caramel flavour. I was very surprised the mango flavour taste very yummy. 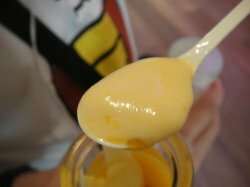 The mango puree tasted like real mango and the milk pudding was very very smooth like yougurt. The Caramel pudding was slightly disappointing. 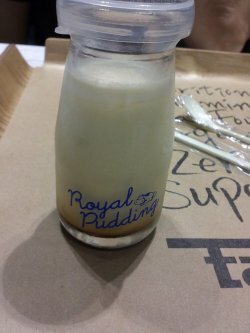 The bottom layer of caramel tasted like burnt sugar, though the milk pudding was smooth and milk. It was very crowded at 7.30pm but we were lucky to be able to get a table within 15mins of wait. I don't quite like their concept cos there isn't any queuing system. You have to wait around & "grab" the next available table. Meaning, if you're slow or is in a big group, you probably won't be able to get a table easily. It feels like you're waiting for table at coffee shop/ food court. 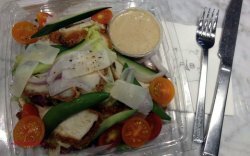 The Salad comes with Sesame Dressing which taste quite good. However, it'll be better if the chicken is grill/ steam rather than fried. The chicken is a little over-fried & somehow a little tough. A little spicy on the dressing, but nice. Prawns are fresh but I don't like the peanuts on the shredded chicken. Can be quite filling cos of the noodles. 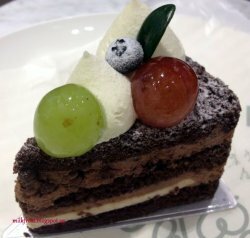 Took a mouthful of this & like the Earl Grey Cake, the cake is soft & fluffy with nice chocolaty flavor.